The book, There Was An Old Monster! is always a hit with the Lil Divas so I knew we had to have some monster fun with it. Are you ready for some fun? 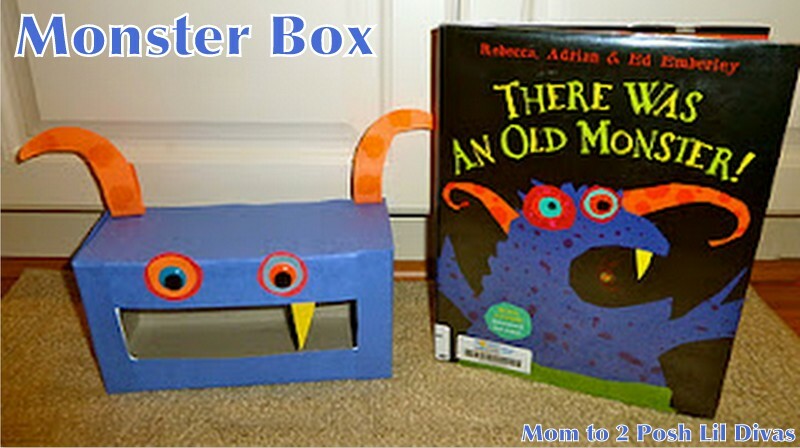 We LOVE how our Monster box turned out! & I think we did a fabulous job! What do you think? It was pretty easy too! Ready to make your own monster box? 1. 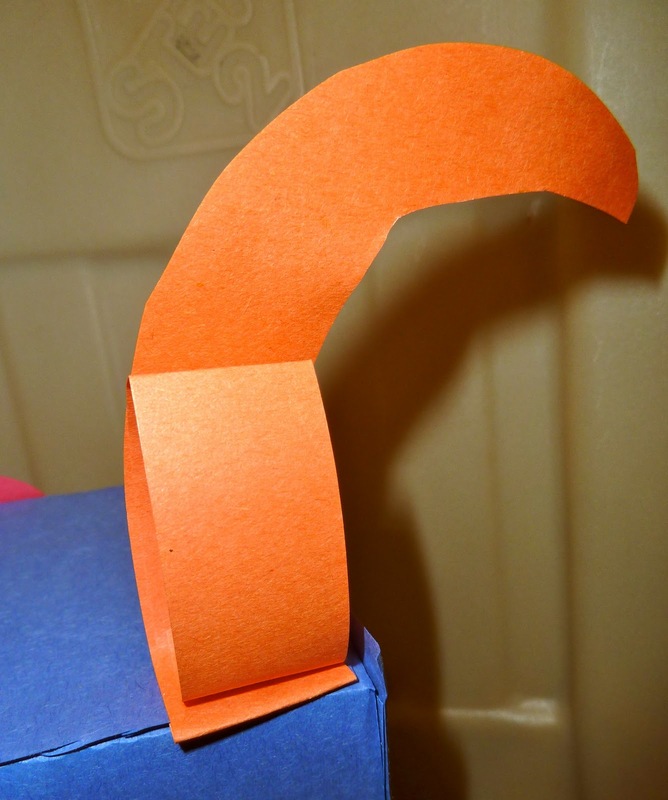 Wrap the tissue box in construction paper. 2. Take a send piece and cover the sides. I measured and cut the paper as needed. Now your monster face is covered & ready for decorating! 3. For the horns I cut out a horn shape to match the photo. The Lil Divas used bingo do-a-dot daubers to make dots on them. 4. To make them stand up on the box - I cut a small strip of paper and made a circle. I glued it to the back of the horn and voila - they now stand up nice & straight! 5. For the eyes the Lil Divas cut circles from various colors of construction paper. We used 2 for each eye and topped with a colored wiggly eye. I LOVE the mismatched & misshapen eyes - so fun! 6. Add 1 yellow tooth and your monster is complete! there are so many ways to use this little guy! the Littlest Diva had to feed the monster the correct number. she had to get in on the action! Then I had her practice counting to 100 by 10's. 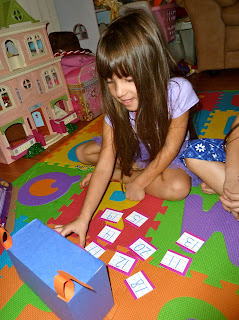 She counted out loud and fed the monster the correct numbers as she went along. 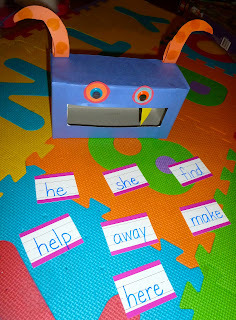 Then of course we practiced a few sight words that have been giving her some trouble. She had to read them and if she was correct, she could feed them to him. practice letters, numbers, math, colors & more. Making Learning fun had these great printables. I just changed it up a little by using a paper bag with a ziploc inside. The girls loved seeing all the things the monster ate fall into his belly! We had lots of fun with this book! SERIOUSLY!!! This idea couldn't get anymore AMAZING!! so creative!! I jsut got an empty kleenex bow and was thiking...mmmmm what can I do with this!! Thanks soooo much for the fun idea!!! I love this. I've got to try it! What fun! Must try it sometime, my boys would love it and feeding a monster letters or numbers would keep them excited. This is fantastic, really, you always do the funnest learning games. I need to do this with my girls. Hi there. This is a fun idea! Little sweet monsters are the best. I linked up my recycled circle tree. I have often wanted to link up but always seem to miss it because I don't tend to blog on Sundays. :) Thanks for inviting me again. :) Also thanks for your comment love so good to hear from other mommies that have a similar interest and craft obsession with their kids.;)ps. your blog name is super cute. I would love it if you would share it at http://craftymomsshare.blogspot.com/2011/11/sharing-saturday-4.html. Thank you! That is incredibly cute! Thank you for that idea! I love how you not only made it a craft but also a learning tool too. I'm going to use this for my two preschoolers! I'm hopping over from http://www.bargaingab.com if you feel like taking a look! I'm now following you via RSS. This is TOO cute!!! Love the idea! This is awesome and so going on pinterest. DS is going to love this when we do our monster unit. LOVE your monster, such a great idea! thanks so much for sharing on craft schooling Sunday! Aaaah that is a brilliant monster! Isn't he just fun! And the book sounds great too! Super cute monster! Love him. I know our kids would flip if I made something like this for them. What wonderful monsters! The bag with clear tummy is something I will have to do. fun craft! I like the activity with the numbers you made out of it too. Thanks for sharing on monday madness. He looks just like the monster in the book! 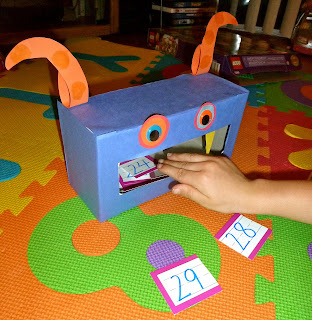 Very cute - love the use of the numbers and sight words too. Thank you SO MUCH for this idea my completely non-crafty eldest LOVED this! He even cried when I said it was time to stop so we could make hotdogs and popcorn for family film night!